Visit us at Intertabac 2018 in Dortmund! 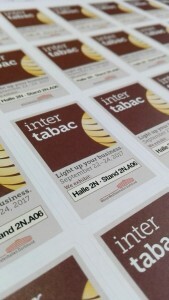 Intertabac is the biggest trade show for the tobacco industry worldwide bringing over 500 companies from 50 countries together. IterTabac is a key trading platform for exhibitors from Europe, Asia, Africa and both Americas who are looking for new markets. The number of exhibitors is growing by the year only proves the importance of the show. This year Chemnovatic will be showcasing its range of nicotine bases, flavorings and e-liquids – both OEM and own brands of TPD compliant e-liquids. You will find us in hall 2N on stand 2N.A06.